Oven Baked Tacos are the perfect family dinner for busy weeknights. All of the tacos are baked at once in a 9x13 pan! Brown the ground beef and drain the fat. Add water, taco seasoning mix, salsa, and cooked rice. Heat until thickened, stirring often. Rinse and drain a head of romaine lettuce. Cut it into thin strips. 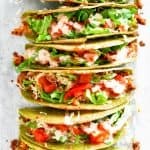 Line the taco shells up in a 9×13 pan. Spread one tablespoon of refried beans in the bottom of each taco shell. Sprinkle one tablespoon of shredded Mexican cheese over the refried beans. Top with two tablespoons of the taco meat and rice mixture. Bake the tacos at 400˚F for 7-10 minutes. Remove from oven and sprinkle with an additional tablespoon of shredded Mexican cheese. Top with shredded lettuce, salsa, and taco sauce.